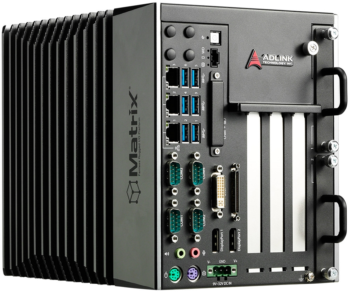 ADLINK's MXC product line provides fanless embedded computers for high-performance embedded solutions. Leading the field, high-performance computing power combines with PCI/PCIe high-speed expansion slots in a compact enclosure fully enabling integration of a variety of applications. 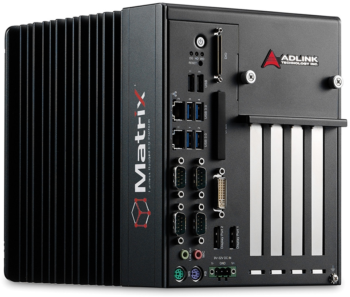 ADLINK's revolutionary series of Matrix fanless embedded computers provide an optimal computing platform with expandable options to customers. 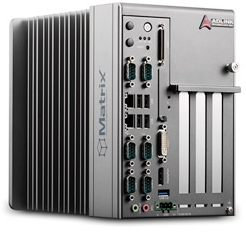 These platforms are the result of combining ADLINK's expertise in x86 platform design, versatile I/O function development, and thermal design to push fanless systems to a higher standard, including a wide operating temperature, 5 Grms vibration, and cable-free durable structure.With a sturdy hardware design, the Matrix MXC and MXE series are ideal for developing reliable embedded systems effortlessly and offering time-to-market solutions to mission-oriented industries. 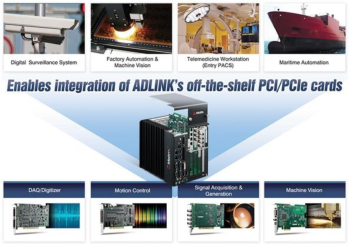 ADLINK takes the advantage of flexibility to offer diverse comprehensive I/O interfaces to meet requirements for a variety of industrial applications. 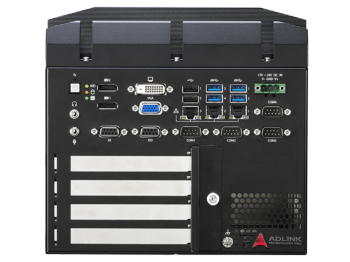 ADLINK's MXE product line provides fanless, cable-free, robust mechanisms in a compact form factor. The rugged design provides reliable performance in mission-critical harsh environments. Outstanding wireless optimization capability easily meets and exceeds customer needs, make it an ideal match for intelligent transportation and factory automation applications. MVP-6010/6020 - ADLINK Technology Inc.
ADLINK's newly introduced MVP-6010/6020 Series value line of fanless embedded computing platforms, incorporating the 6th Generation Intel® Core™ processor, provides one PCIex16 and three PCI or two PCIe x8 and two PCI expansion slots, 1 mini PCIe slot and single-side access for I/O ports, optimizing easy maintenance in industrial automation environments. The series retains the robust design of all ADLINK MXC/MXE lines, at a new extremely cost effective price point. 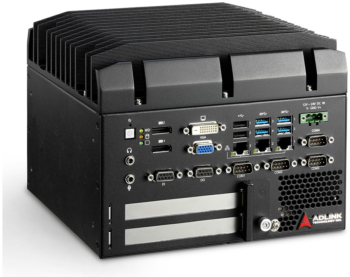 MVP-6000 - ADLINK Technology Inc.
ADLINK's newly introduced MVP-6000 Series of fanless embedded computing platforms, incorporating the 6th Generation IntelR Core? processor (Code name: Skylake), provides one PCIe Gen3 x16, one PCI slot, 1 mini PCIe slot and single-side access for I/O ports, optimizing easy maintenance in industrial automation environments. The series retains the robust design of all ADLINK MXC/MXE lines, at a new extremely cost-effective price point. MXC-6300 - ADLINK Technology Inc. 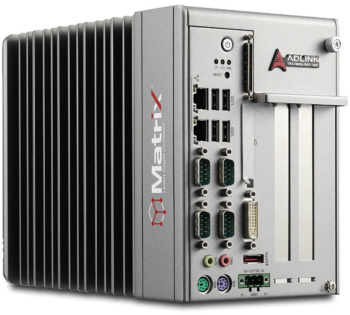 The Matrix MXC-6300 series is a high-performance fanless embedded computer integrating a 3rd generation IntelR Core? i7/ i5/i3 processor and QM77 chipset to provide powerful computing and excellent graphic performance. Graphic-intensive and computing-oriented applications including image and vision measurement, machine automation, maritime automation, surveillance and high-resolution medical imaging can all benefit. MXC-6000 - ADLINK Technology Inc. The Matrix MXC-6000 series of powerful fanless, expandable embedded computers feature the new Intel Core i7 2.0 GHz processor for maximized computing. The MXC-6000 inherits its exceptional fanless and cable-free design from ADLINK's existing Matrix C series.The MXC-6000 series' Intel Core i7 2.0 GHz processor and Intel QM57 chipset deliver a level of performance ideal for image and vision measurement and automation applications. PCI and PCIe slots allow integration of off-the-shelf PCI/PCIe cards for development of configurable application platforms. 16 built-in isolated DIO channels enable standardized industrial control. A DVI-I connector output on the front panel allows direct connection to a LCD panel, and one eSATA port supports storage expansion or hot-swapping SATA drives. MXC-2300 - ADLINK Technology Inc. Featuring the latest Intel Atom? E3845 processor (Formerly Bay Trail), the Matrix MXC-2300 series excels with minimal power consumption, exceptional 3D graphics, and powerful media acceleration, delivering a leading improvement in performance and cost- efficiency over any previous generation Atom-based system. Features include dual-port CAN connectivity supported by a Philips SJA1000 controller that can run independently or bridged at the same time, bus arbitration and error detection with auto correction and re-transmission capability, and 16-CH isolated DI/O for general industrial control. MXC-6400 - ADLINK Technology Inc. The MXC-6400 Series' 6th generation IntelR Core? i7-6820EQ/ i5-6440EQ/ i3-6100E processors boost computing power by up to 70%, delivering 100% faster graphics performance than previous Matrix generations, up to 3 independent displays are supported, accelerated HW media codecs enable Ultra HD 4K, dual-channel DDR4 2133MHz SO-DIMM sockets accommodate up to 32GB of memory, and PCI and 2 PCIe Gen3 x8 (or 1 PCIe Gen3 x16) slots fully optimize expansion.